How Do We Strengthen Our Inner Conviction? Saraswathi Vasudevan is calm, soft-spoken, confident and filled with a wisdom that is deeply grounded in everyday experience. Through yoga she is a healer, teacher and researcher. For close to two hours the Hyderabad Awakin Circle were the beneficiaries of her words. Saraswathi began her journey on the path of yoga and healing 25 years ago. She trained under Sri TKV Desikachar for over 17 years in the tradition of Sri T Krishnamacharya. It is a path that is strongly founded in the teachings of Patanjali and specializes in adapting yoga to the unique needs and abilities of the individual. 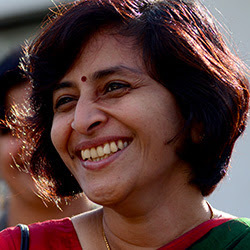 In 2010, Saraswathi and her husband Sundar, founded YogaVahini, dedicated to specialised Yoga Training, Therapy and Research with centres in Chennai and Hyderabad. What fuels people? There is a secret ingredient; what is it? What takes us deeper and deeper? Takes us forward? The secret ingredient [that does so], is really important for me as a yoga teacher and researcher. It is like a thread that can be held on to. I’m reminded of someone who was, for me, the epitome of this secret ingredient. I call her a close friend because she is very close to my heart, though we only met three or four times. The first time we met, she came for therapy. She couldn’t use her arm, she had lost all strength, all musculature. It was an autoimmune condition that created immense pain. She had a morphine pump to control the pain. That’s how she came to yoga. A year later she had cancer and it was quite bad. I was in Australia and we met in a park. She was wheeled in with an oxygen cylinder by her husband. We had a good time. We ate, laughed, talked and meditated together. I asked her what keeps her going. She said, “The cancer has spread everywhere. It is in my liver, my spleen, my spine. It is all over me. But you know what, Saras? My brain and my heart are intact.” And she laughed. What makes you persevere I asked her? “I don’t give up. As long as I live I want to be happy, and I continue,” she said. All of us were moved to tears by her passion for life, the celebration of life. So for me, the secret ingredient that she carried was her love for life; she infused in everyone around her. The secret ingredient is called shraddha in Sanskrit, the desire or inner conviction. There can be no yoga without shraddha. The problem is when we take something out of context, like asanas, and focus on it. Asanas is a good beginning. But yoga is an umbrella under which only a small part is asanas. We know the body is impermanent (it will age, get disease, perish), so can we go beyond that? Can we connect with something deeper than the body? Yoga is the quiet mind that helps discriminate between the right path and the distracting path. And shraddha therefore, is the deep inner conviction to follow my yoga. It is the internal energy or strength. It is not about external success. Can I develop a qualitative shift of mind? Can I move away from frustration and confusion towards clarity and reflection? It is easy to be caught up in the powers of yoga. The simple powers of being able to touch the floor, of people complimenting you on a glowing face, of at some level, being able to read somebody’s mind….We can get really caught up… but we need to focus on achieving the quiet mind. A mind that can completely show me who I am. Krishnamacharya used say about shraddha, “Aham graha upasana.” To be close to understanding, or enquiring into who I am. That which will take me to myself. So can yoga take us deeper and deeper into self-enquiry and hold us there? Mandela, Gandhi, Ramana Maharishi, all had strong shraddhas. So what weakens our shraddha or inner conviction? So how can we strengthen a shraddha? We can teach and guide but the students have to tap their shraddha to practice. As a teacher we can give then a practice – that’s easy, breath is 50% of the work, then diet or nutrition, and listening to their life. But yoga therapy is not chat therapy. We can’t do the practice for them. So how can we awaken their shraddha? If yoga has chosen me then there is something in it that I need to explore. Even in our teaching, we as teachers are constantly learning. Every student is such a wonderful teacher. Teaching reminds us of what we have forgotten. How can we tap into this energy that is within us? Shraddha is not in the mind, it’s beyond, it is in the deeper mind. Shraddha is the key. It knows the direction, it knows the way. If I can quieten the intellectual mind down and listen, then shraddha will guide me. It will guide each one of us. That is the promise of yoga. I will stay with my abhyasa, my perseverance, my practice, without thinking, “What will I get out of it?” I need to stay with my enquiry, my study, my service….If I can do that, and hold onto that thread, then I will be shown the way. What are the number of asanas? …This whole idea of exploring many asanas…Yes, you need to take care of the body. But if we begin to identify with the body then that becomes an end by itself. You cannot get out of it. So when people come and ask, “How many asanas can you teach?” We say, “we will teach what is appropriate for you.” It is not a super-market where you pick and choose. We think if we can do so many asanas then that means I am fit and healthy. But doing too much of asanas can also cause problems. On an average out of 50-60 postures, we pull about 10 or so to do per day…In our texts out of the 195 sutras only 3 pertain to asanas. So it is important to distinguish between yoga and asanas. Yoga is the large umbrella under which asanas reside. Studying the scriptures, the sutras. My own practice will help me stay healthy so I can have a clear mind so that I can understand myself better. And that will show me the way. Reflection, in a community. Because what I can’t see, you can show me. We can be mirrors for each other. That’s why community is such an important part of spiritual growth. Listening is a powerful medium of awakening the shraddha. We need to accept that we have our weak moments. A community is very important. One that is consciously coming together to move forward on this path (not just to have fun). Can we come together to do something meaningful? Everyday we should do a bit of all three. Yoga works all your muscles and systems. Other than swimming and wrestling all other forms exercise specific parts. So running is good for your heart and lower body. But what about your spine? Your neck? Your shoulders? Yoga itself will show you the goal. Yoga will guide me and show me how to get there. 20 minutes to stay healthy and then work with a teacher. You need to do different kinds of asanas. Suryanamaskars alone is not a sarvangasaddhana (full body exercise). If you are at the gym or running or playing a competitive sport, your blood is going to the extremities. Your sense organs have to on alert. You are in stress mode. So you can run or perform. In yoga asana practice there is circulation all through. Your internal organs are getting more blood. You can’t compare one with the other. That may give some benefits but you can’t substitute. How did you create a community? What were the challenges? Initially I really wanted to create a community and worked towards it. At some point I realized that I am not doing anything. If something is happening through grace then I just have to step out of the way, not get in the way. So can I deepen my practice and support the group, so that what will happen, will happen? I need to do it consciously -- to step back. When we have a space for self-disclosure, and that space is held with compassion and a non-judgmental attitude, then the community can grow. We need to create such spaces. They don’t happen by default. We need to create a context to share. We should be able to listen and offer support. To be who we are. That gives us strength and purpose. In the Krishnamacharya tradition it is not the same practice for everybody. We take into consideration who is this person, what is it that they need, what is it that they can do, what is their flexibility, what is their strength, what is their lifestyle, what is their health condition, what is their state of mind? We go into a thorough assessment of everything and we offer something that is appropriate for that individual which over a period of time is progressively changed. It is changed to suit their changing needs. We are constantly changing – our minds, bodies, our life-context… So your practice should change. And it is always one-on-one. For each person -- what can I offer? When can I start yoga for my child? The ideal age, Krishnamacharya has said, is when a child can say, “I am hungry, give me food.” Is that 4? 5? The seed has to be sown early. Parents have to practice. [lots of laughter]. We find yoga works when the parents practice. Taking kids to yoga class once a week is not enough. There needs to be a home environment. And even if they stop doing, they will come back to it. What is a good time to start yoga? Every day is a new beginning. Abhyasa means ‘today I have to start’. Tomorrow, again I have to start. What was it like to learn from Desikachar? From the beginning to the end of class he would throw questions. We would have to find the answers. He would say, “Ok, come and do paschimutanasana.” The person has to do it. He would ask us, “How would you do it? how would you prepare her to do it?” Each one of us has to answer. Sometimes he would say, “No” or just be quiet. If I think another posture will work, I need to teach that person. In one week we would learn so much. Because if you have to teach it, you have to go home and practise. Everything was through questioning. For someone doing bhujangasana, he would say, “See can you see how he is tilting his head?” I couldn’t see it. So I would keep looking and looking and looking. Questioning was mostly his style of teaching. If he is happy there will be a little smile. Otherwise go back, read, observe, ask someone to do a posture. There was a lot of compassion. Because we were so scared. Only the foreigners would ask questions :) So he treated us with a lot of compassion. He always knew what you wanted in the moment. Like sometimes I would be very depressed and would just go sit in front of him and cry. He would say, “I will chant for you.” He’d choose a long passage and chant for 40 minutes. By then I would have calmed down. I’d say, “Thank you, sir” and come away. He would have said nothing J No discussion, no questioning, just unconditional love and offering. He always motivated us to do the best we could be. Do you only get unwell people or do healthy people come as well? Yoga therapy is all about creating a harmony between the body and the mind. We really believe that the body has the potential to heal if the right conditions are created. We look at diet, lifestyle, appropriate asana practice with breathing. The breathing reduces the pain. Then the person feels more empowered that he can deal with it. The empowerment comes in the mind. So what is health? It is not purely at the physical level, right? It is a balance, a harmony. Can I be in touch with reality at a level where I am not shaken by what is happening around me so quickly. That level of strength is what I think yoga can give. Yoga will never promise that you will never fall sick… If you stay long enough [with yoga], it helps strengthen the mind to deal with the realities of life better. How do you work on listening? We do a lot of work where we get into groups of three where one is sharing, one is listening, one is observing. So we build it consciously. But listening is also something that comes naturally when your mind is quiet. So if I can do a good pranayama practice and I sit down to listen, I listen even better. When you see the value of that listening, when I can listen without holding onto my thoughts or my judgments, just that act of listening, can be so healing to the person who is sharing and to me, who is listening. When you see that power, you want to do it better. I am logging into the service space website after many many months! And what I see first is this talk by my teacher....Being, learning and teaching at YogaVahini has changed my life forever in profound ways! That her talk is about Shraddha, and we have moved to our home on our farm and named our home Shraddha too :) Many small signs as I walk on this path of Yoga. Thanks for posting ... I missed attending it as was away out of city ! Thank You Suchi for posting this...I was just planning to email you an update on Terri but instead received the gift of this article as well. Beautiful talk by Saras as usual. Thanks for sharing Suchitra. Every time you hear her, there is so much learning!